One of my favorite things is spending time outdoors – when the weather permits, that is. Recently, I started thinking about how I could spruce up my outdoor living spaces and give myself a bit more organization and space outside. I looked around and found 24 of the most amazing DIY storage ideas that will help you to organize your lawn and garden. These are all easy to build and you can make a lot of them with upcycled or repurposed materials so they are really cheap. If you love spending time outdoors but could use some organization, these are perfect for helping you to keep things put up and out of the way. Whether you need organization for your pool area or you want to update your garden shed, you are going to find the most perfect DIY storage idea to help you to make the most of the outdoor space that you have. From storage options for your garden hose to a great little outdoor storage locker for gardening tools and plant necessities, these are some of the most useful DIY storage ideas. And, you should also check out these 49 brilliant organization tips for the garage. Organizing is such a lifeline for me. I love nothing more than finding a place for everything and keeping things put away so that I can maximize the space that I have available. These are honestly some of the most creative tips for organizing your outdoors and they are all so very easy to make. You can buy outdoor organization but why would you spend all of that money when you can simply make your own? And, you have the satisfaction of showing off your DIY organization. Be sure that you also take a look at these 30 organization tips and projects for the bathroom. You can get your indoors and outdoors a bit more organized! 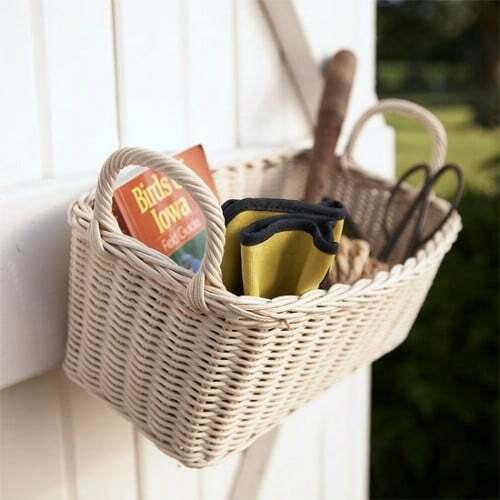 A simple wicker basket can give you so much storage potential in the garage or garden shed. You could even hang wicker baskets on your deck and use them to keep small gardening tools or even toys organized. And, wicker baskets are pretty cheap if you hit up your local thrift stores. Goodwill normally has them for around a dollar or so each and they hold so much stuff! You can get large – like really huge – bolts at any hardware or home improvement stores. You can then use those bolts to hang up any number of things to keep them more organized. 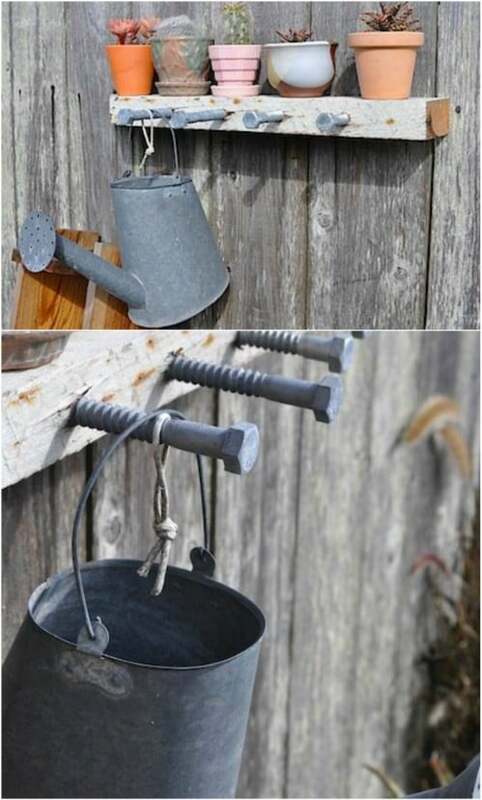 Use large bolts to hang your gardening essentials like gloves or a watering can. These would also be great for drying towels by the pool or you could use them to keep your garden hose rolled up and put away. I absolutely love this bike storage rack. Not only does it help you to keep your bikes all together and organized, the bikes slide into the rack so they are hidden away. This helps to keep your lawn cleaner and more organized and helps to protect your bikes from the weather. If you don’t have a garage where you typically store your bicycles, this DIY bike storage rack is an absolute must. And it’s a pretty easy build, too. You could buy one of these outdoor storage benches at any home improvement store or most department stores, but it will set you back quite a bit. A good one is going to cost you way over $100, but you can make it for just a fraction of that. These things have great storage potential and they double as seating so if you are planning huge outdoor gettogethers and don’t have enough seating, you will when you build one of these. Plus, it’s a pretty easy bench to build. You can also build a great looking storage bench from cinder blocks that gives you loads of space. 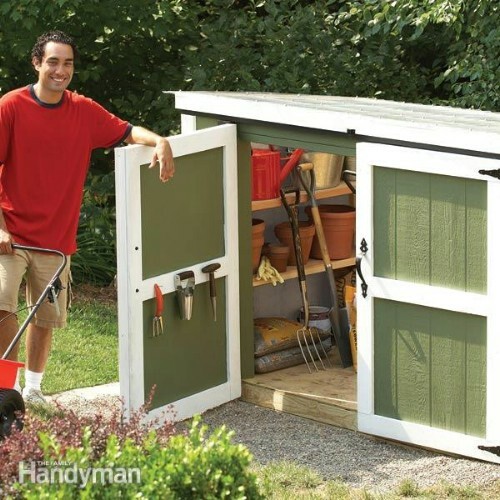 This little tool storage shed is really simple to make and it helps you to keep those garden tools organized and protected from the weather. Build it wherever you have room – it’s pretty small so it doesn’t take up much space. And, you could use wood that you have leftover from other projects. Even if you have to purchase all of the lumber, this one will be much cheaper to build than it would be to buy. Just a few things from around the house could help you to organize your tool shed and keep things put away. Plastic bins that you can get at the Dollar Store can be used to hold gloves and other items and you can add closet bars to hold tools that can be hung and your garden hose. You don’t even have to buy anything for this one – just repurpose things that you already have on hand. The next time you visit the Dollar Store or your favorite thrift store, pick up a galvanized bucket. 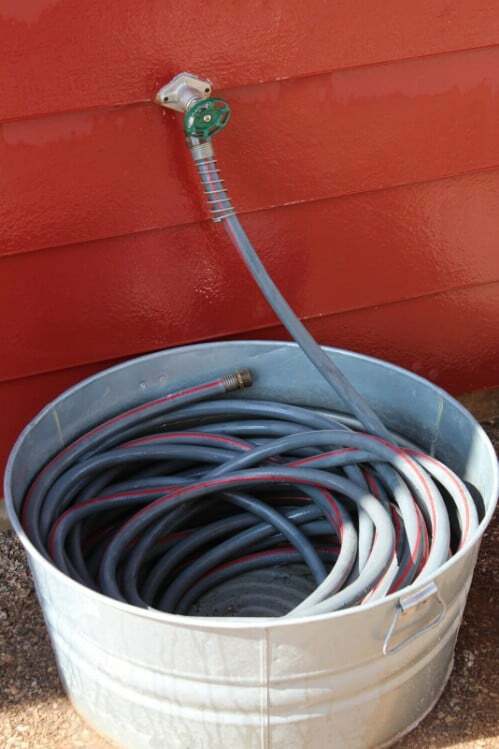 You can use it to create the perfect farmhouse storage for your garden hose. Not only will your hose fit inside perfectly, you will have the most adorable hose storage in your neighborhood and this is one of the simplest DIY projects that you could do. You really have to love DIY farmhouse furniture and décor. 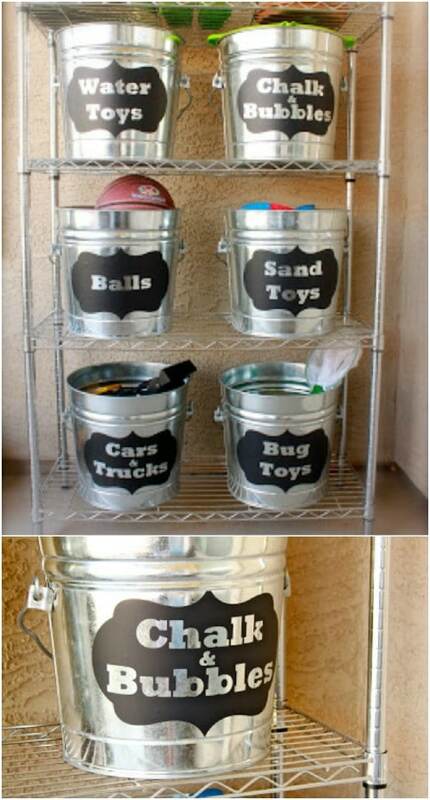 Those outside garbage cans are great for keeping trash out of the house but what about organizing the can itself? 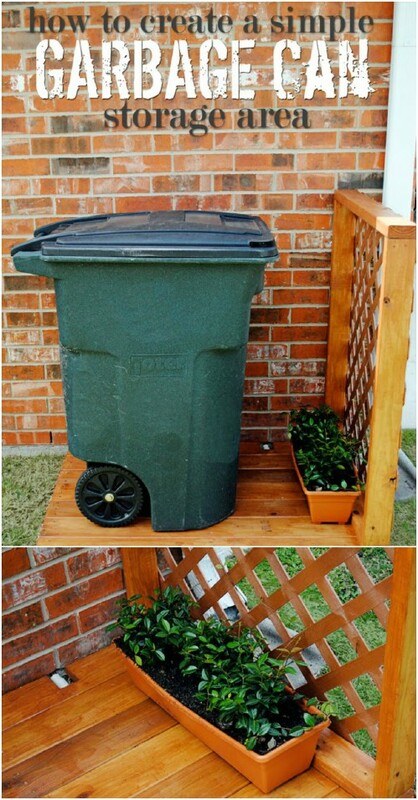 This DIY garbage can storage area is really easy to build and a little lattice sort of hides the can away from the door. Plus, it keeps your trash can off the ground so rain and snow won’t get all over the bottom and it is much easier to move to the curb when trash pickup comes around. 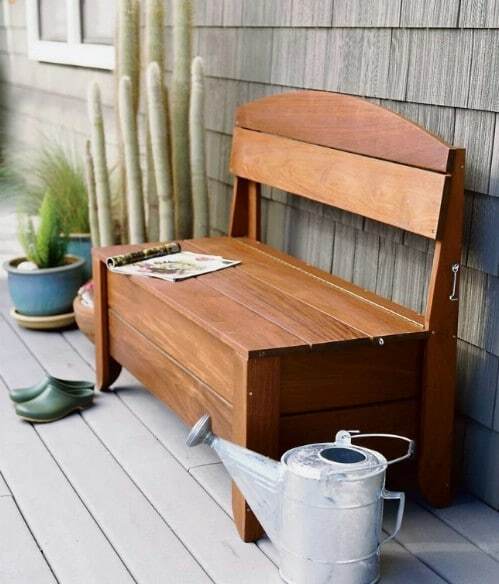 This little bench is perfect for hiding away your garden hose or other garden necessities and you can build it in just two days and for less than $200. You can’t buy a bench like this for cheaper than $200. Not only does this one give you a bit of storage but you also have extra seating for when you host those outdoor gettogethers. 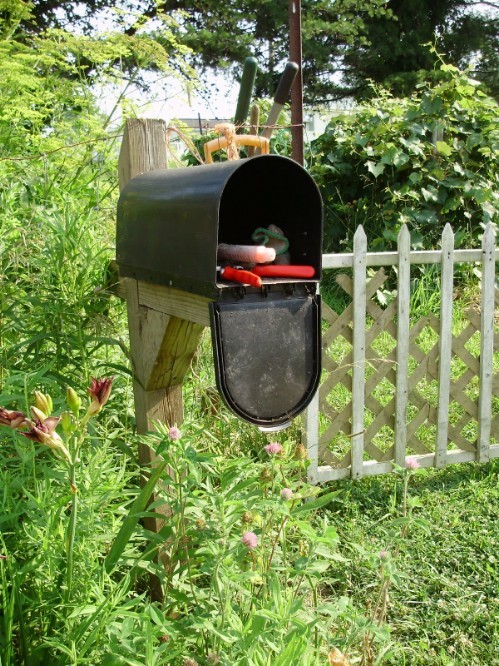 When you replace your mailbox, upcycle the old one into an adorable storage compartment for your garden tools. Even if you don’t plan to change out your mailbox anytime soon, you can buy a metal mailbox at any home improvement store for around $10 or check your local thrift stores. You can often get them there for just a couple of dollars and they make a great storage potential and decoration for your backyard. I love DIY pallet projects and this one is amazing. It doesn’t take much work to get it up and you can use that pallet to organize so many things. 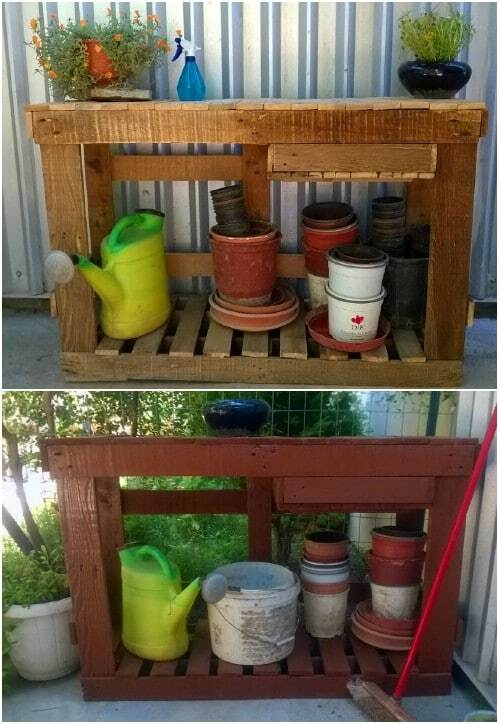 Whether you want to hang your garden tools on it or use it to organize your plants, that upcycled pallet is the perfect garden organizer and if you have a pallet or two on hand, this one won’t cost you anything to build. Take care of putting away that garden hose and give yourself a gorgeous new planter box at the same time. This is a genius DIY project and it’s a pretty easy one to build. The top of the planter box holds your favorite flowers or plants and it lifts off to reveal storage in the bottom for your rolled up garden hose. 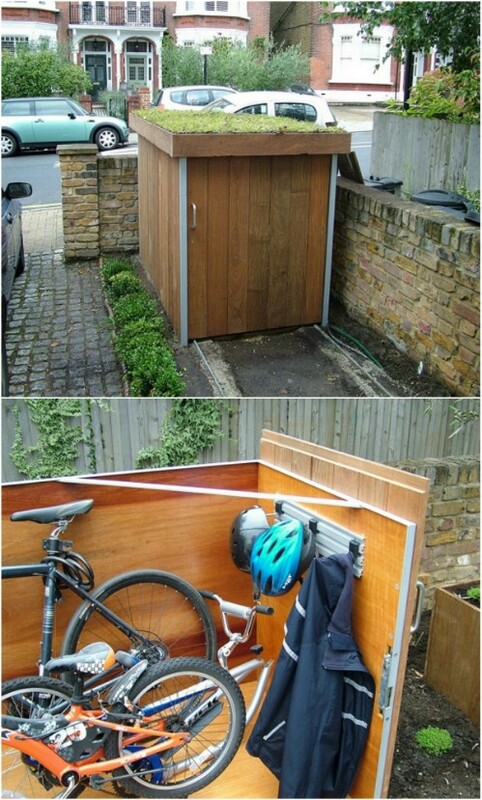 You could build a couple of these and use them for all sorts of outdoor storage. 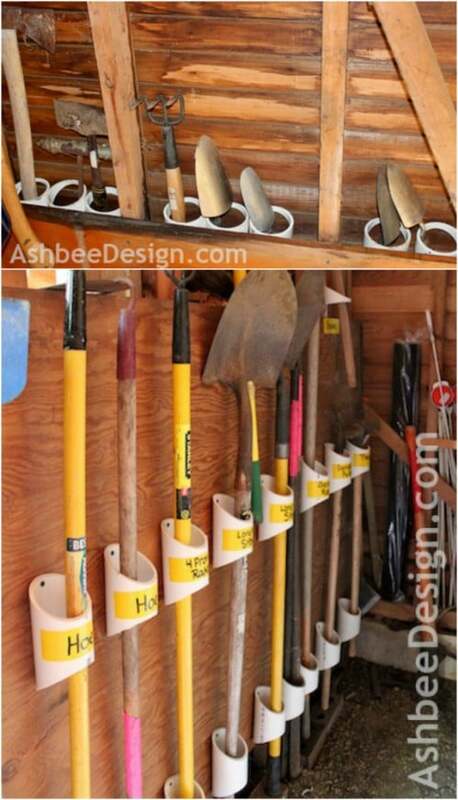 Organize those long handled garden tools with just a few pieces of PVC pipe. PVC pipe is really cheap at home improvement stores and it has so much repurpose potential. If you have a rather long piece of pipe on hand, this one is a free DIY project. You can hang those tools in the garden shed or even in the garage and to get really organized, label them so that you know where each tool goes. 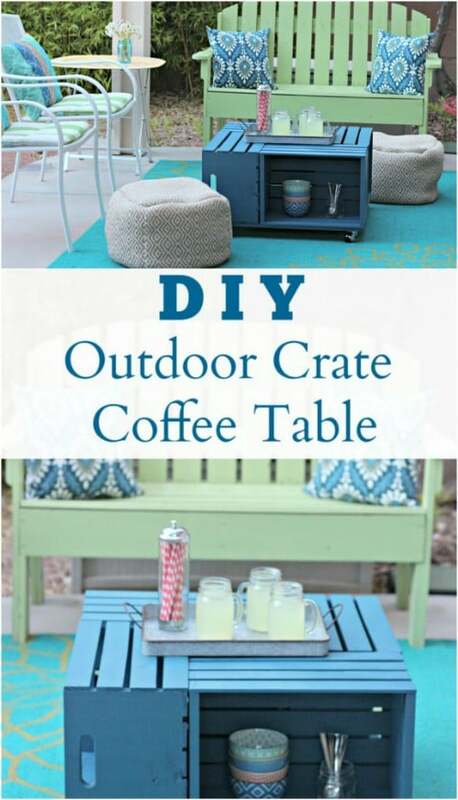 You can use old pallets or wooden crates to build this gorgeous and functional outdoor coffee table. On the one hand, it is perfect for adding to your patio seating area and on the other hand, it has loads of storage potential. Use it for your gardening tools, the kids’ outdoor toys or just anything that you need to get put up and out of the way. 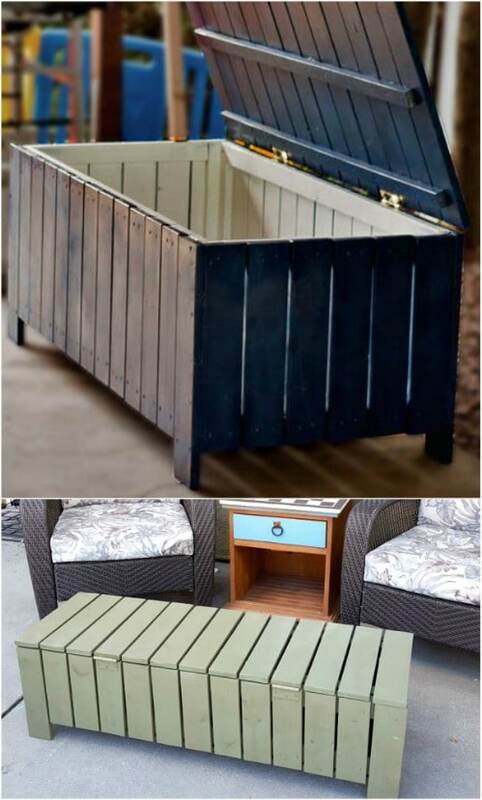 Here is another great outdoor storage table that you can build in no time. This one can be done with all sorts of leftover lumber from other projects and it is perfect for storing so many things. Use it for your patio pillows or blankets that you use during colder weather. If you have a pool, this is also a great place to store towels and other pool necessities. You can build this little outdoor storage locker in a weekend and for just a couple of hundred dollars, depending on the supplies that you may already have on hand. You will spend several hundred dollars to buy an outdoor storage locker of this size, or you can just take a weekend and build your own. This one is small but it has loads of storage potential and is perfect for keeping your garden tools organized and put away. Just a few galvanized or plastic buckets and a shelving unit give you everything that you need to keep outdoor toys perfectly organized. You can buy these little buckets for just a dollar or so each and you can use chalkboard paint to label them so that the kids know where everything should go. 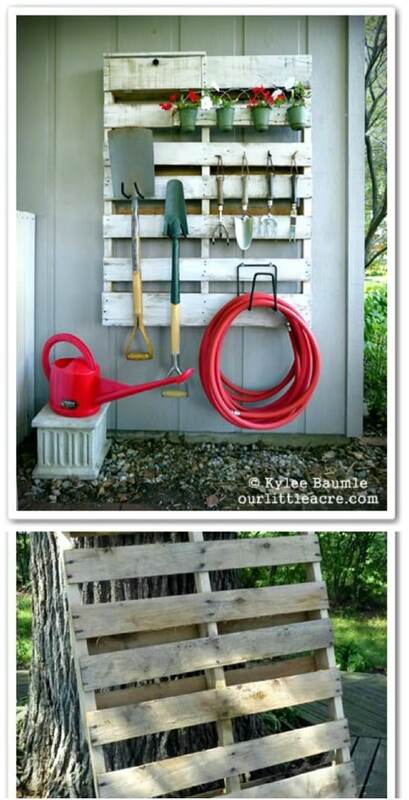 This is also a great idea for gardening necessities – the ones that can’t be hung up. This is a great hack to keep kids’ toys organized. 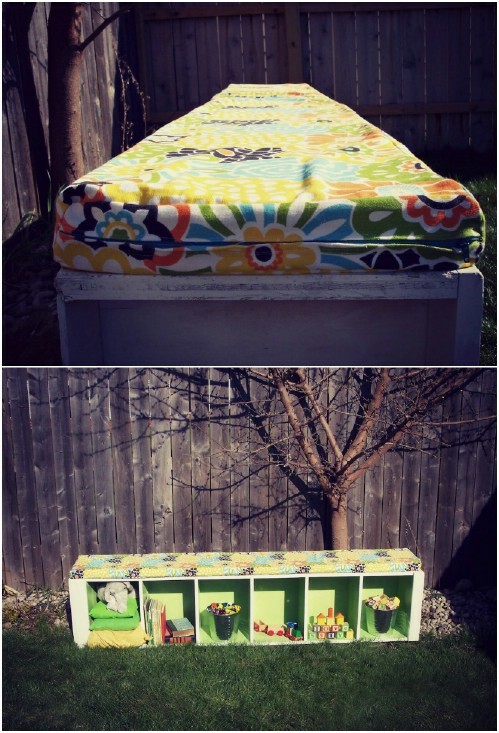 I absolutely love this DIY padded storage bench. This would be great indoors or out and it is perfect for adding some extra seating and some organization at the same time. The best part? You don’t have to build this one. You make it from an old wooden shelf and just add the padding to the top. The shelving areas give you loads of storage for outdoor toys, pool supplies and anything else that you need to keep put away. Okay so this project is great for a couple of reasons. 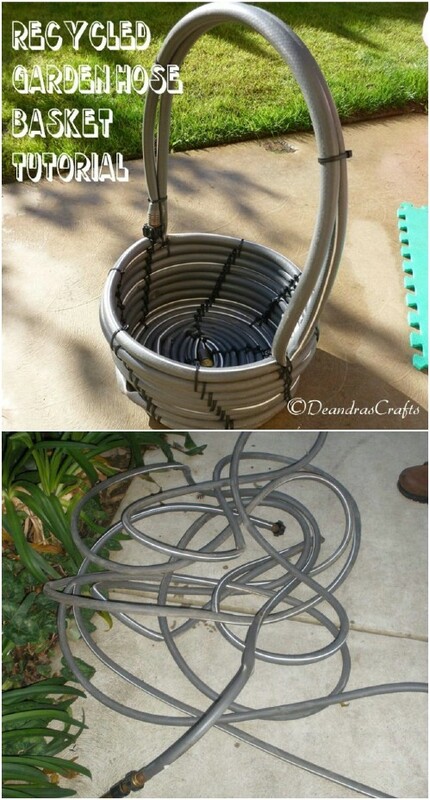 It is a basket that you make from an old garden hose, so it is an adorable recycling DIY. 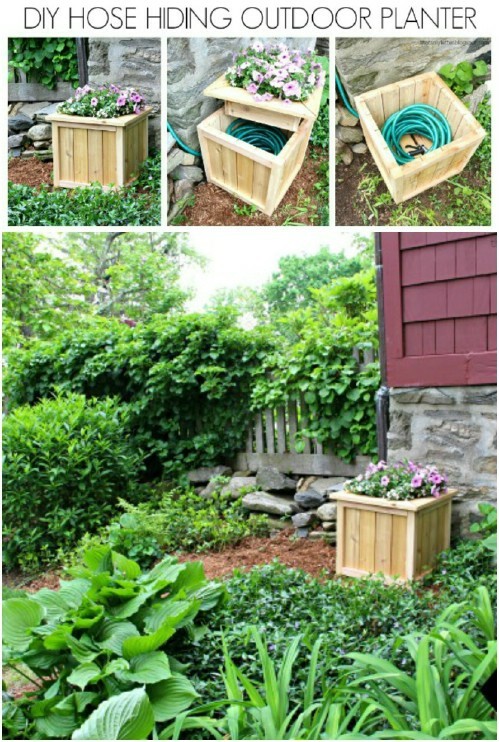 Plus, you can use the garden hose basket to house your current garden hose. It’s so great! You use a garden hose to house a garden hose and to keep it organized and looking so neat and tidy! 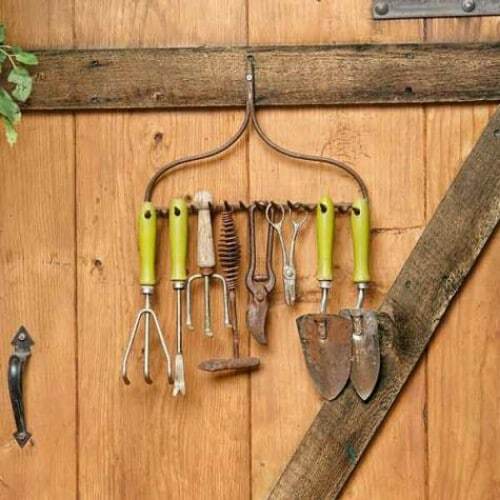 You can hang those smaller garden tools on an old garden rake and organize them perfectly. Your rake head could be hung just about anywhere from the fence to the garage or garden shed. If you don’t have an old rake that you can use, just visit flea markets or yard sales, or check out your local thrift store. You can get them really cheap. This little potting bench can be built in a weekend and it offers so much storage potential! 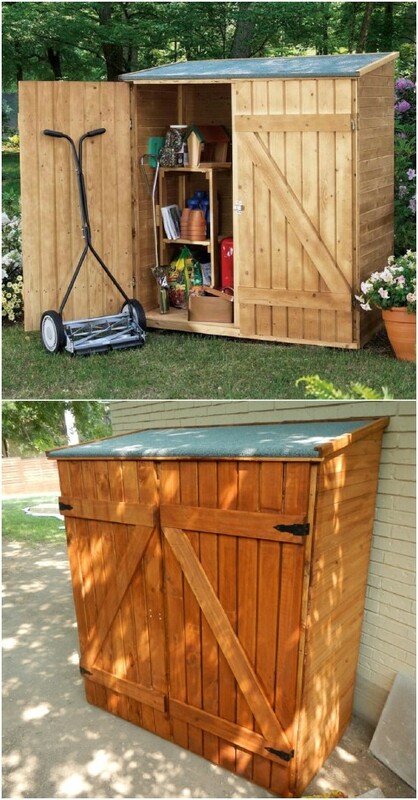 You can put this on the deck or out by the back fence and use it to store your gardening tools and supplies. Plus, the workspace is perfect for getting your seeds ready for planting and for pruning your outdoor plants. And you can build this with upcycled wood if you have any on hand. 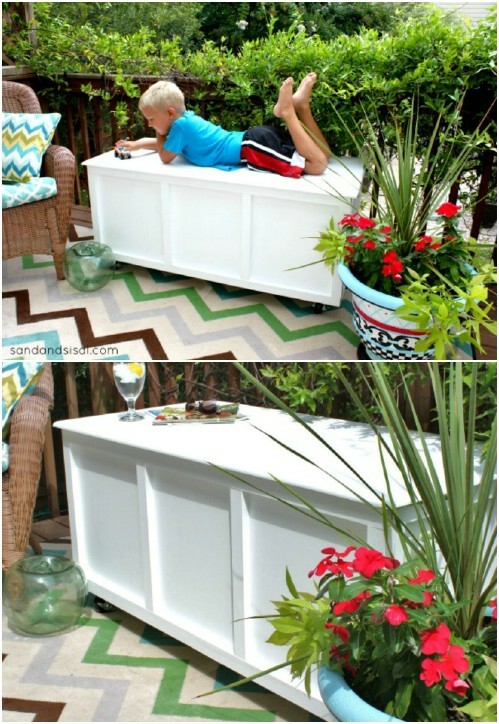 Here is another great little DIY outdoor storage bench that won’t take you long to build and offers plenty of space for keeping your outdoor living spaces organized. You can build this one in a weekend and it doesn’t cost much, especially if you have a lot of wood that is leftover from other projects. 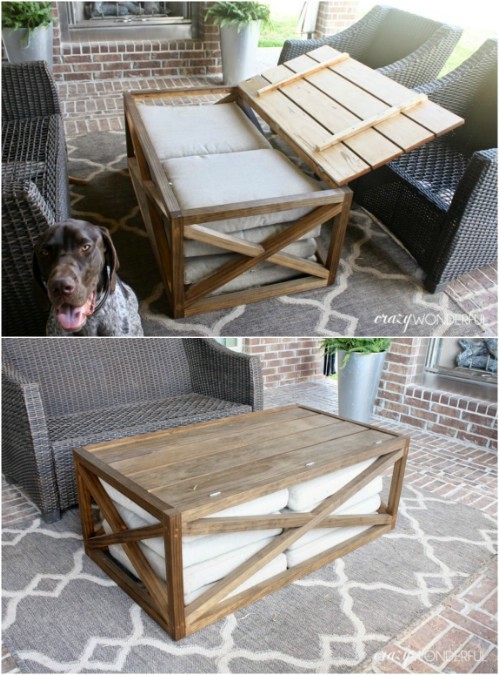 This would be great on the deck for extra seating and you could even DIY a couple of throw pillows to go on top. 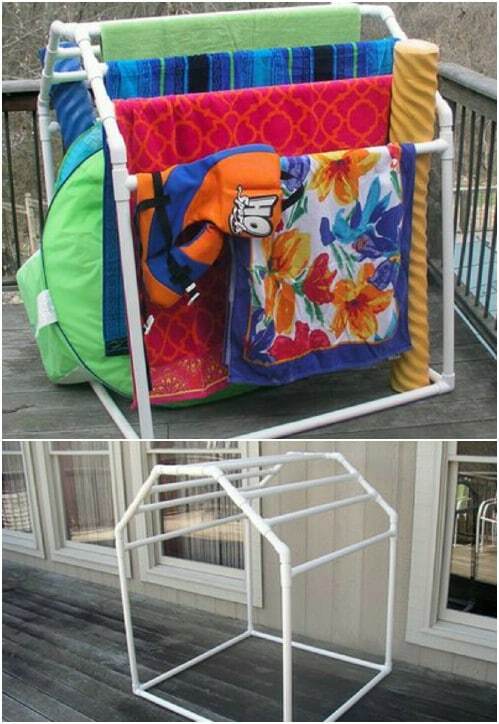 If you have a swimming pool then you know how difficult it is to keep those towels organized. You want somewhere to hang them while you are enjoying your pool and somewhere that they can drip dry so you don’t make a mess moving them into the washing machine. This tool rack is made from PVC pipe and it is really easy to build. It’s perfect for keeping towels organized while you’re swimming and even while you’re not. There really are some great PVC pipe organizing and storage ideas out there. You can get a shoe organizer for just a couple of dollars at Walmart or the Dollar Store and these things are so versatile. 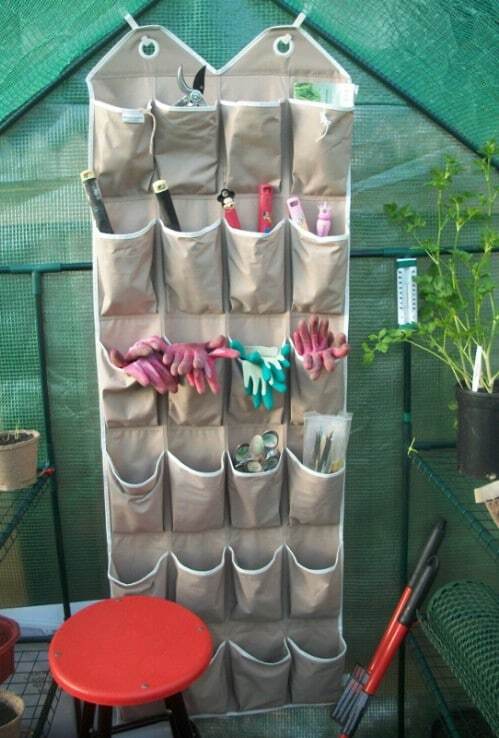 They can be used for so many things, including this great DIY garden necessity organizer. Just hang that shoe organizer on the door of your garden shed or even on your fence and use it for holding small gardening tools, gloves and other necessities that need an organized home.